Traditional Nihari recipe by Sidra Rafique at PakiRecipes.com. 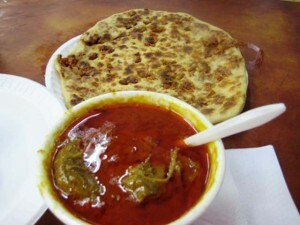 This is a traditional brunch item from Pakistan - served with Naan bread. This recipe is simple to put together but takes more than normal cooking time. First heat oil and put in the onions till brown. Then put the beef and mix well. Then put ginger ,saunf ,zeera and cardamoms and mix well. Then add tumeric powder,ginger +garlic paste, red chilli powder, salt and ghee and stir well. Let it cook till beef is tender. Make paste of flour and add in it and continuously mix it. Just before serving, put freshly fried onions alongwith hot ghee . Serve the delicious spicy nihari with sliced ginger , green chillies and corriander leaves. Thanks. It is easy for cooking. Quantum of flour had not been mentioned. It is very easy to understand for cooking. It is the most delicious and easiest way to cook. I just wanted to know how many green cardomoms am I suppost to use in this recipe?It doesnt say how much and is it 1 tsp for both garlic and ginger paste?